The grooviest Island in the Maldives, located in the UNESCO world biosphere of Baa Atoll (30 minutes by speedboat from sister resort Amilla Fushi) Finolhu is the ultimate island experience for chic couples, fun-loving families and gatherings of friends alike. Here, you let your hair down; for good. 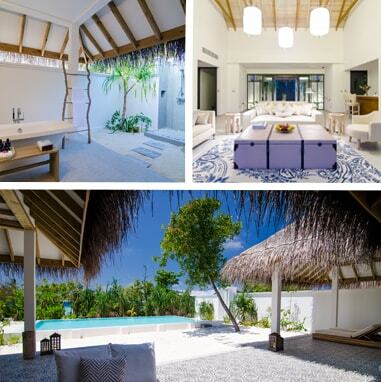 Finolhu offers a vibe that’s anything but typical of the Maldives, this is an island getaway with a difference. Explore this funky five star with a tennis court, four restaurants and a lively pool area full of bright inflatables, pumping music, stilt walkers and acrobats, mesmerizing natural beauty, white sandy beaches and breath-taking turquoise lagoon; you certainly won’t be bored. 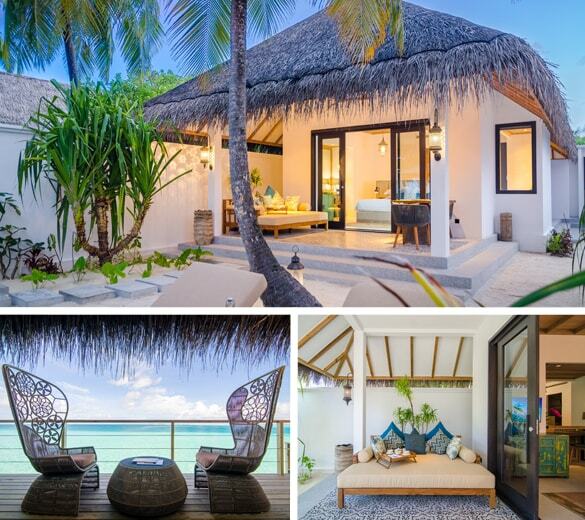 While the interior of Beach Villas is decked out with bright and beachy design, the dreamy Lagoon Villas offer dreamy ocean views, eclectic furnishings and pops of retro cool. 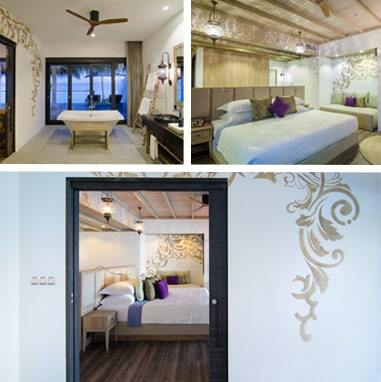 Finolhu’s luscious Lagoon Villas give you a 145 sqm of overwater Bohemian-style pad with panoramic views. Perfect for hanging loose or getting your groove on, these 180 sqm overwater villas are splashed in the colours of the French Riviera. 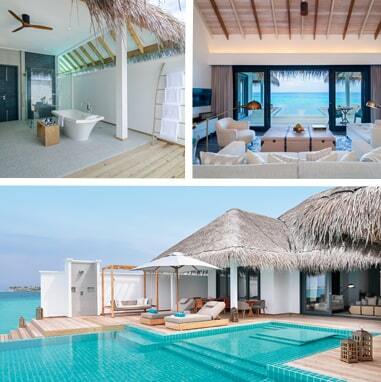 Your own pastel palace surrounded by crystal seas, where you can dive straight into the ocean from your private deck. No need to part with the view when you head inside – your luxe indoor bathroom gives you stunning ocean vistas from the bathtub and shower. Perfecta-mundo! 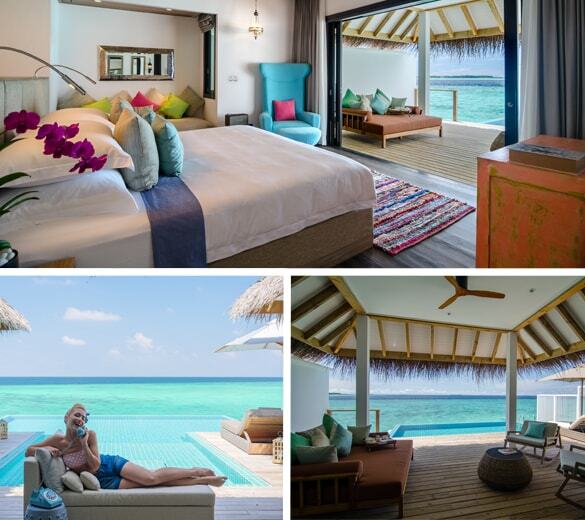 The chic overwater Two Bedroom Ocean Pool Villas of 460 sqm come with a private 8m freshwater pool and a spacious deck with sun loungers. The perfect accommodation for families or groups of friends travelling together to live it large in a tropical paradise. Our Beach Pool Villas offer an amazing 205 sq m of floor space, private beach access, your own private pool and a swathe of souped-up amenities. They offer more room, more fun and more of Finolhu’s beach to yourself! An indoor/outdoor bathroom lets you bathe with fabulous views, while the villa’s awesome Marshall sound system provides crisp clear sound so you never need to be without your tunes. The sprawling 530 sqm two-bedroom Beach Pool Villas are ideal for beach lovers, families or a group of friends travelling together. These villas come with chic, whitewashed interiors and have two master bedrooms, a private dining lounge, separate bathrooms and loads of fab amenities. Relax and be pampered on chandelier-lit divans in one of 10 pastel-coloured treatment huts of the Cove Club, each celebrating an iconic diva of the 60s and 70s. Find your groove with rejuvenating and reviving treatments. 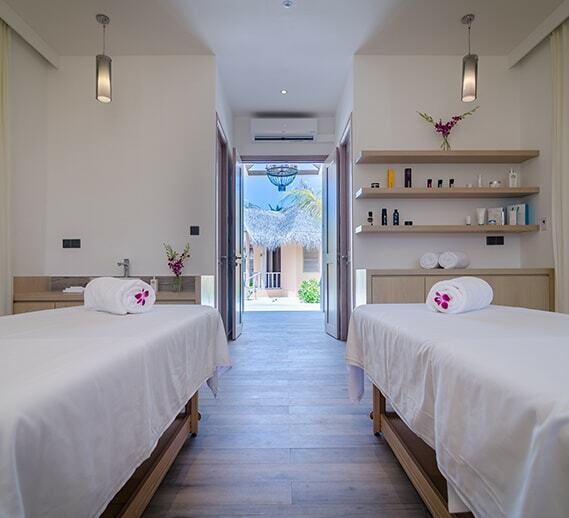 Prepare to shine with beauty treatments, massages, hair care and other treatments that will leave you feeling and looking out of sight. The nearby fitness centre has indoor and outdoor gym facility too with our resident fitness trainer. Baa Atoll is one of the 26 natural atolls in the Indian Ocean, with some of the richest waters for sea life in the Maldives – officially declared a UNESCO Biosphere Reserve. 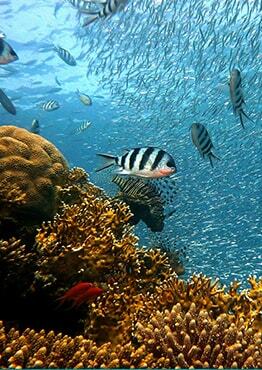 This means that all the incredible sea creatures who call this crystal-clear water their home are protected from fishing and development. As a super-chilled, unspoiled haven for marine life, the diving and snorkelling here is fantastic. Some of these marine life is unique to this area! 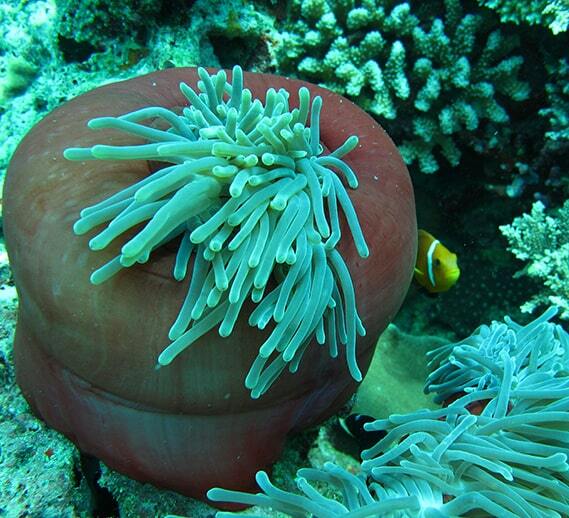 Finolhu offers a great variety of cuisines from around the world. The 1 Oak Beach Club, the Baa Haa Grill, Fish and Crab Sack are three of Finolhu’s world class restaurants that serve mouth-watering dishes from around the world. 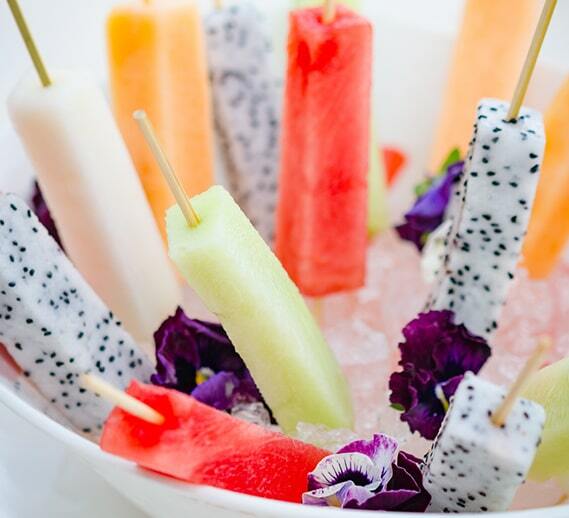 The Milk-Bar gives you plenty to nibble on and a bevvy of holiday essentials. On the tip of the island Kanusan is Finolhu’s premium dining venue. Seating up to 60 guests, Kanusan features a totally fresh overwater bar area. If you’re interested in underwater escapades, the Dive Butler team will be jazzed to welcome you to Finolhu’s state-of-the-art Dive Centre. They will hook you up with the latest tech; top-end gear that delivers unforgettable aquatic experiences. No need to freak out if you’re still a diving rookie. 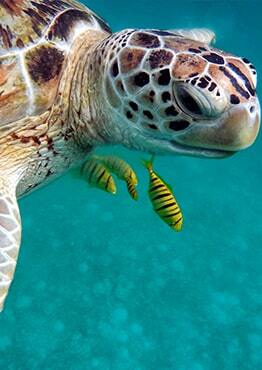 You’ll always be under the watchful eye of our highly certified underwater experts. For certified divers, the small group philosophy turns every dive into an extra special experience. Get out there and explore! The H.U.B. team has a wide range of scheduled excursions, so everyone can see Baa Atoll’s UNESCO Biosphere Reserve in their own preferred style. Simply relax on a deserted sand bank, swim with dolphins around stunning coral reefs, or dive headfirst into Maldivian culture at a local village. Mask up with a choice of Snorkel Safaris. When it’s the season, an excursion to Hanifaru Bay to snorkel is a must so you can make friends with the mantas. To really get your motor running, shimmy over to Palm Beach, where Thunder ball occupies a stretch of Finolhu’s 1.5km-long lagoon – a calm and crystal-clear body of water that's a totally awesome location for high-octane water sports. 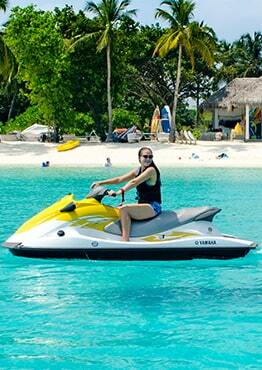 Take to the seas 007-style with a jet-ski or Seabob. Or let us take the controls while you try out some knee boarding, wakeboarding or water skiing. Always dreamed of learning to windsurf or sail a catamaran? Our savvy instructors can show you the ropes. Water sports aren't the only way to get your heart pumping at Finolhu. Palm Beach Tennis Court is our floodlit synthetic grass court, complete with a tennis professional for coaching sessions for individuals or groups. The Oceaneers' Club is a hip and happening hangout for our younger guests. From tots to teens, kids can enjoy activities especially created for them by our trained staff. With sports, board games, cooking classes, crafts and supervised activities in and on the water, Finolhu Oceaneers – which is what kids are known as at Finolhu – definitely won't be bored.